Through a hole in the cover, an owl invites you to meet a forest tree and its inhabitants of every season. The life cycle of a flower told through the adventures of a tiny seed. A good book as winter merges into spring and the tiny seed begins its cycle. A history of the interpretation of trees through art, literature, and even politics (the sycamore, for instance, was at the heart of England's first trade movement). An Audubon member hosts this monthly series at the Freeport Public Library. During the program, there is a special story time followed by an activity related to a theme. Friday, March 17, 3:30 to 4:30 p.m.
Intended for older children – See the Feb./March newsletter on page 4 for more detailed information. 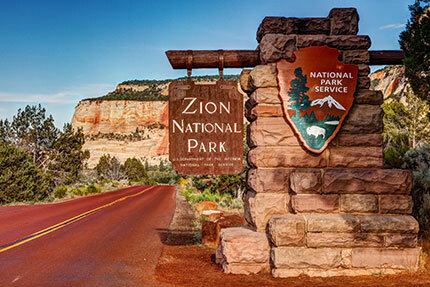 Celebrate the first day of spring by being outside! Juliet will provide binoculars for the kids to see which birds have returned to the area and also find resident birds. Dress for the weather. Sign-ups are encouraged – please use Facebook or call Juliet at 201-233-0946. Call if weather is questionable. Meet in the parking area of the Newell Tract, found on the west side of Cranes Grove Road. SAVE THE DATE! 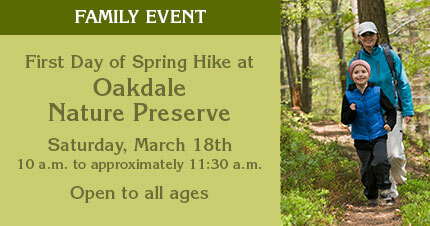 … for an exciting earth day EVENT at Oakdale Nature Preserve. More information will be provided in the next newsletter. 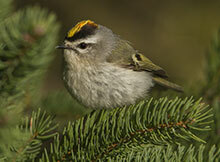 One of our tiniest birds, the golden-crowned Kinglet is able to survive in some very cold temperatures. This little bird usually nests in our northern forests but winters throughout much of the continent. It is usually found in very thick conifers, especially those of spruce, fir and hemlock. It likes pine groves like those planted in cemeteries and parks. This is a very active bird making it hard to spot high in the trees. It hops among the branches, often hanging upside down from the tips of twigs. The female can lay a surprisingly large number of eggs, sometimes as many as 5 – 11! The diet of these birds is mostly insects, including small beetles, gnats, caterpillars, aphids and others. It will also eat spiders and rarely feeds on fruit. The adult male is a dull grayish olive above, paler whitish below and head boldly marked with yellow crown bordered broadly with Black. The orange color in center of yellow crown is visible only during display or when the bird is excited. The female does not have this yellow/orange crown. One of the calls it makes sounds like a high jingling, tsii tsii tsii. If you take a walk at Oakdale this winter and stand and listen for the calling, look up high in the trees and you just might be lucky enough to see this special little bird, hardly bigger than a hummingbird, flitting from branch to branch. * Information adapted from Cornell Lab of Ornithology site animals.nationalgeographic.com and Audubon.org “Guide to North American Birds”. February can seem dreary, but conifers cheer us, giving us the gift of green against gray skies. 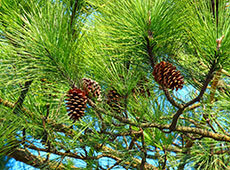 Take a walk noticing the different conifers in your yard and neighborhood. Collect some of the cones and needle clusters. Are the tops of the trees rounded or pointed? How are the needles of various conifers different? How might animals use conifers? Kids and adults alike can hunker down with these two coloring books (or others); all that you learn in these can sharpen awareness when you then take them along on late winter walks. 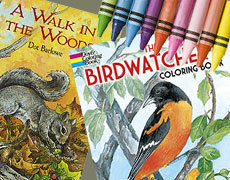 Birdwatchers Coloring Book, Dover Nature Coloring Books. A Walk in the Woods, Dover Nature Coloring Books. For all ages. 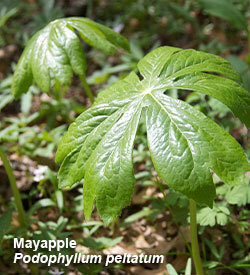 The woods in all seasons are celebrated: includes the amazing life below pond ice and the early spring flowers.